Spring is finally back! If you’re travelling to Korea in between end March to early April, it’s your chance to catch the magnificent cherry blossom trees in full bloom. The entire Jeju island will be engulfed in King Cherry Blossoms from March onwards. The King Cherry Blossom’s petals are known to be the largest and most luxurious among the other species of its kind. The main highlight of Jeju is located only 5 minutes from Jeju International Airport. 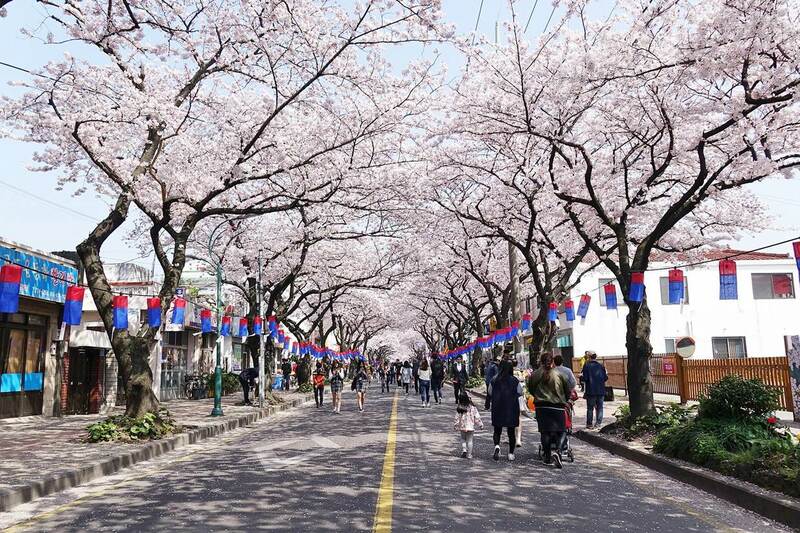 The Jeonnong-ro Cherry Blossom Street will be filled with not only a breath-taking view of the spring florals but also food stalls and flea markets. Don’t miss out on Noksan-ro, the one and only place where you can enjoy 10 kilometres of cherry blossoms and canola flowers. It was crowned as one of the top 100 most beautiful roads in Korea. The best way to get around Jeju is to rent a car and self drive around the island. Click here to read our review on our self-driving journey in Jeju last November! The next alternative is a guided taxi tour with an experienced local to bring you around the best spots to see cherry blossoms (and hidden gems for the best food places too). Travelling on budget? We have you covered as well! The spring-only bus tour covers the iconic viewing spots and Jeju’s famous Dongmun Market in a day. Recommended places to visit in Jeju: Seogwipo Downtown, Jeju Sports Complex, Jeju National University, Gwaneumsa Temple, Wimi-ri Ilju Road. Jinhae Cherry Blossom Festival, also known as Jinhae Gunhangje, is South Korea’s largest cherry blossom festival held in Jinhae. Covered with pastel hues in the day and illuminated with lights at night, visit the Yeojwacheon Romance Bridge for the best views at any time of the day. Watch out for the One-Year-Steps where you can climb 365 steps to the top to enjoy an unobstructed view of the festival. Don’t forget to drop by Jinhae Jegwa (진해제과) for their famous cherry blossom bread (경남 창원시 진해구 중원로43번길 4). Being the most popular cherry blossom festival in Korea, bus tickets to and fro the Jinhae Gunhangje might be challenging due to its popularity. Getting there from Seoul, take a bus from Nambu Terminal. However, return tickets are only sold over the counter when you arrive in Jinhae. There are possibilities of the bus tickets getting sold out! Hence, it is recommended to book your trip in advance. Opt for a free-and-easy day tour departing from Seoul and Busan, or a longer duration full day trip departing from Busan. Famous photo spot at Gyeonghwa Station (경화역) in Jinhae. Recommended places to visit in Jinhae for Cherry Blossoms: Gyeonghwa Train Station, Jangboksan Sculpture Park, Jinhae NFRDI Environment Eco-park, Jehwangsan Park, Anmingogae Hill. Recommended places to visit in Busan for Cherry Blossoms: Dalmaji Hill in Haeundae, Igidae Park, Oryukdo, Cherry Blossom Road at Namcheon-dong, Mt. Hwangnyeongsan Ring Road, Oncheonchon Stream Park, Samnak Ecological Park, Daejeo Ecological Park and Yongdusan Park. The annual Gyeongju Cherry Blossom Festival takes place at the Bomun Lake located in the Bomun Tourist Complex. Home to over 9000 cherry blossom trees, click here to find out more about what’s in it for you at this attraction. *Registration will be opened until 15th March 2019. *Travelling in a group? Try the 8-hour private tour from Busan with an English-speaking guide! #1. Touch and Go for travellers with limited time! #2. A to Z for travellers who want to see everything! Gyeongpo Lake is known for being one of the best places to see cherry blossoms in Gangneung, where the Winter Olympics 2018 was hosted. The annual Gyeongpo Cherry Blossom Festival is held at the Gyeongpodae Pavilion in Gyeongpo Lake. Expect entertaining performances, food stalls and various shops set up during the festival. After you are done, don’t forget to check out the Gyeongpo Beach located nearby the area. Recommended places to visit in Seoul for Cherry Blossoms: Kyunghee University, Seoul Grand Park, Namsan Tower, Changdeokgung Palace, Deoksugung Palace, Unhyeongung Palace, Changgyeonggung Palace, and Gyeongbokgung Palace. Take in the best views of the cherry blossoms at E-World with the majestic 83 Tower as the backdrop, or even better – view them from a bird’s eye view by taking the newly opened Sky Drop ride, from 103 metres above! Or take it to the next level and enjoy the cherry blossoms at a higher altitude at Palgongsan, where you can opt to hike up or take a cable car. While there aren’t any festivals on Seoraksan, it will definitely be an unforgettable experience seeing cherry blossoms on a mountain! While it may be a hassle getting to Seoraksan by public transport, check out the 1-day bus tour taking you from Seoul to Gyeongpo Cherry Blossom Festival in Gangneung and Seoraksan for cherry blossom viewing!